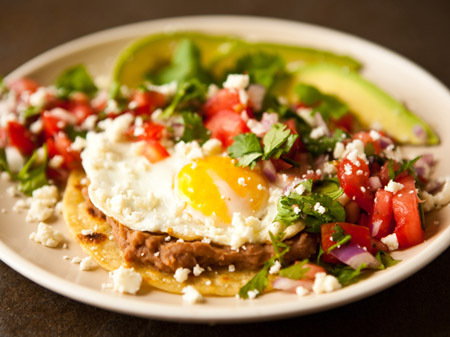 Huevos rancheros, also known as “rancher’s eggs” is a popular breakfast dish comprising eggs served Mexican-style, i.e. fried eggs are served on lightly fried corn tortillas topped with a meat sauce, refried beans and slices of avocado or gaucamole. 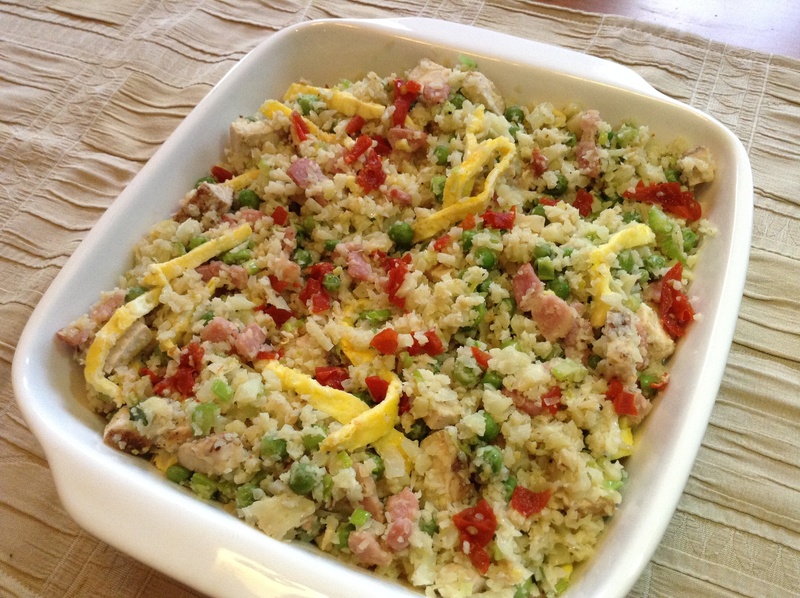 It is a great dish to prepare with leftovers the morning after a Mexican fiesta ! This is a quick and easy recipe and a fantastic way to get all the goodness of egg without flour. Place the pan on the stove and switch the stove on on a moderate heat to melt the butter. Add the eggs to the pan and cook in a similar was as if you were making a pancake. When the egg is set, slip it onto a chopping board, spread a little Nutella onto it or give it a dusting of icing sugar. Fold the pancake in half and in half again before transferring it to a serving plate. 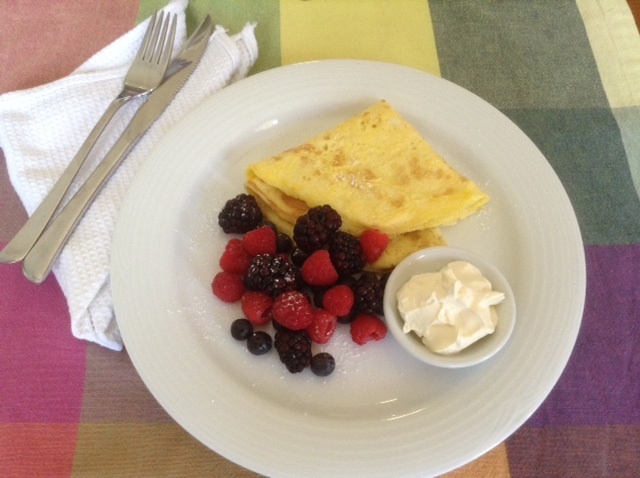 Serve with creme fraiche and fresh berries and a dusting of icing sugar. This recipe can be doubled or tripled according to need. For a savoury version of this recipe, stir-fry 50 ml thinly sliced spring onion in a little butter and sprinkle it inside the pancake before you fold it. Serve it with creamed cottage cheese or creme fraiche, halved cherry tomatoes and snipped chives on the side. 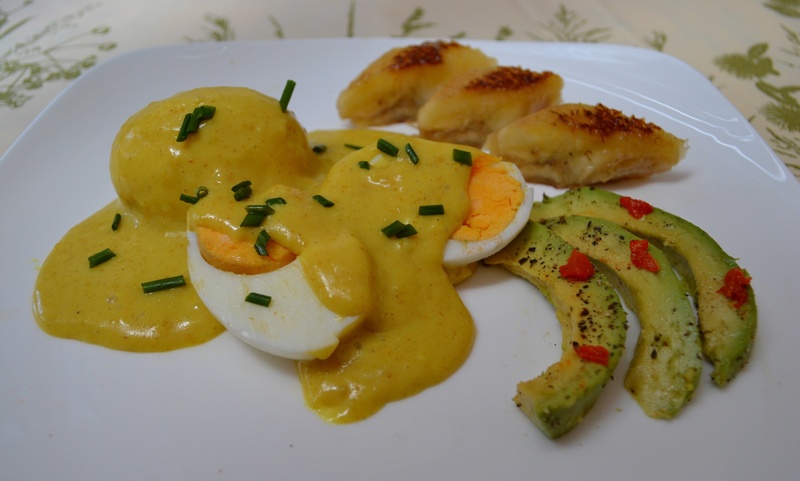 Although Hollandaise sauce is probably most known as an accompaniment with Eggs Benedict, it can also be served with asparagus or artichokes, or with any kind of grilled or poached fish. To poach the eggs, fill a large saucepan with water and add the white wine vinegar. Bring it to the boil and then turn the heat down to a simmer. Crack the eggs into four separate bowls. Work with one egg at a time and pour the egg through a strainer or sieve to get rid of excess egg white. Transfer the eggs one at a time to the saucepan with simmering water and lower it into the water with a swirling motion to release the egg into the water. Do the same with the rest of the eggs. Simmer for 4 to 6 minutes while stirring continuously until set or to taste. While the eggs are poaching, brown the ham in a saucepan. Remove the poaching pan from the heat and cover partly with a lid. Keep the eggs warm in the pan until you are ready to assemble the dish. To make the hollandaise sauce, place the egg yolks in the bowl of a food processor and season them with a pinch of salt and pepper. Process the eggs for about 1 minute. Heat the lemon juice and white wine vinegar in a small saucepan until the mixture starts to bubble and simmer. Switch the food processor on again and pour the hot liquid onto the egg yolks in a slow, steady stream. Switch the food processor off. Melt the butter in the same saucepan over a low heat – be careful not to let the butter brown. Switch the food processor on and pour in the butter in a thin, slow, stream – the slower you add it the better. When all the butter has been incorporated, process again for a few seconds and serve immediately. Halve and toast the muffins until golden, spread with butter, then sandwich a piece of ham in the middle and put in the oven to keep warm. Place the muffins on warmed plates, lift the top muffin and place an egg on top of each slice of ham and then spoon over a generous amount of sauce. It should cover the egg and run down the side. Season with pepper, gently place the top muffin back and serve immediately. Add a few drops of tobasco sauce, a pinch of mustard or finely chopped fresh dill or spring onion. 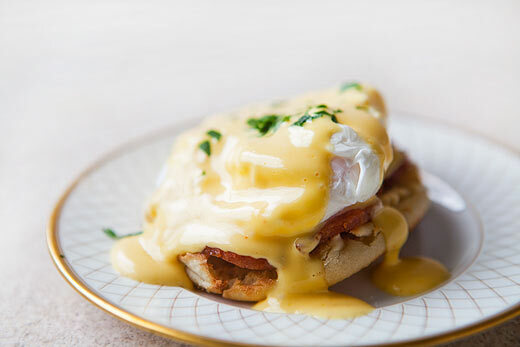 Omit the ham and use 50 to 100 ml heated creamed spinach for Florentine Eggs Benedict. – Serve leftover sauce cold, as reheating will cause the sauce to separate. Add about 15 ml boiling water to the sauce – a few drops at a time while whisking constantly. Pour the separated sauce into a jug. Place a fresh egg yolk in the bowl, whisk and place the bowl over a saucepan with simmering water. Add spoonfuls of the separated sauce to the bowl, beating constantly. This popular French recipe can be served for breakfast, brunch or a light dinner. 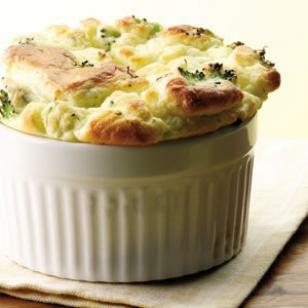 Pre-heat the oven to 200 ° C and grease a 1 litre soufflé dish (14 cm in diameter and 7.5 cm high). Use a silicon brush and spread the butter inside the dish sprinkle the inside with some of the Parmesan, tipping the dish from side to side to give the base and sides a light coating.Empty out the excess and set aside. Steam the broccoli in a medium saucepan until tender – about 10 minutes. While the broccoli is cooking, prepare the eggs. Separate the eggs into the small bowls one at a time, transferring the whites from the small bowl into the larger bowl as you go. When the broccoli is tender, remove it and leave to cool until barely warm. Transfer the broccoli to a food processor and process it almost to a purée. Set aside. Place the butter, flour and milk in a small saucepan and whisk with a hand whisk over a medium heat until you have a smooth, glossy paste. Transfer to a medium mixing bowl and add the Parmesan cheese. Add the 3 egg yolks and the broccoli and mix everything together thoroughly. Add a pinch of cream of tartar to the egg whites beat with an electric hand whisk on low speed for about 30 seconds or until they begin to start foaming, then increase the speed to medium and then to high, moving the whisk round and round the bowl while it’s beating until you get a smooth, glossy mixture that stands in stiff peaks when the whisk is removed from the bowl. It’s better to underbeat than overbeat. Use a large metal spoon and stir 1 tablespoon of the egg whites into the broccoli to lighten the mixture, then empty the broccoli mixture into the egg whites and fold, using cutting and turning movements, until everything is well mixed. Pour the mixture into the prepared dish, place on a shelf in the lower third of the oven and bake for 40 to 45 minutes. When it’s done it should be nicely browned on top, well risen and beginning to crack. It should feel springy in the centre but it’s important not to overcook it. Divide between warm serving dishes and serve it immediately. This popular Italian dish can be served for breakfast, brunch or a light dinner. Pour the egg mixture into the pan and turn the heat down to its lowest setting. Cover the pan with a lid and cook gently for about 10 minutes or until set and lightly browned on the one side. The frittata should still be runny on top. Remove the lid and scatter the tomatoes and goat’s cheese evenly over the surface. Do one of the following: Transfer the pan to the oven and place under the grill (not too close) and cook briefly to allow the egg to set. This will take 20 to 30 seconds. This can only be done if the handle of the pan is oven proof. 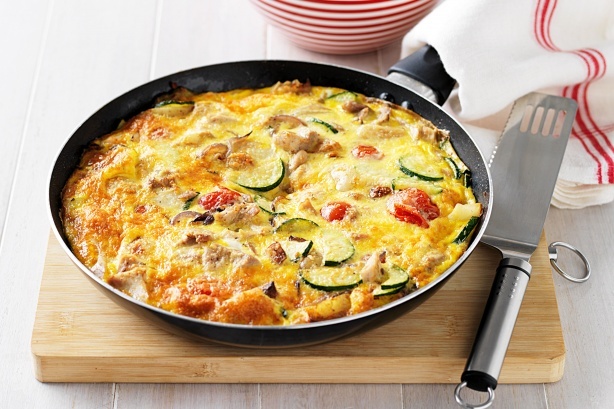 Slip the frittata onto a warm serving platter. Cut the frittata into wedges and serve with a green salad. 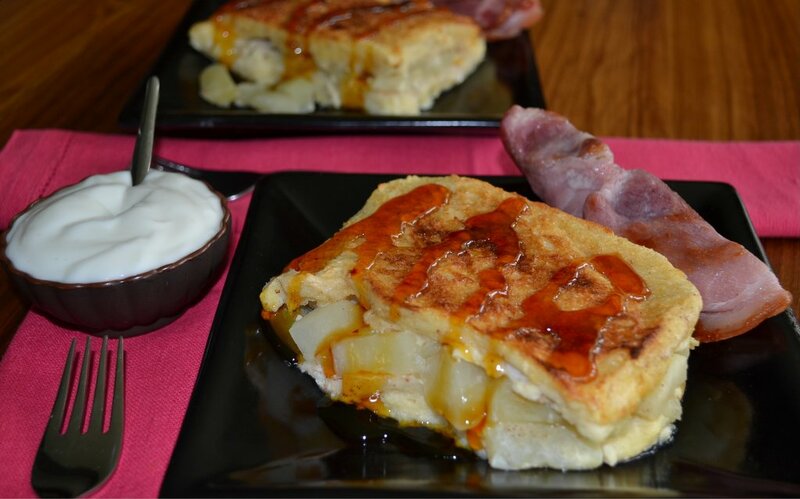 Apple and bread turned into a beautiful baked breakfast or brunch dish, popular with young and old and good enough to serve as a dessert with cream. Peel and core the apples and cut into small chunks. Place into a saucepan with the water, lemon juice and sugar and bring to boil. Boil over moderate heat until the apples are just crisp-tender and most of the moisture has evaporated. Select a shallow rectangular ovenproof dish which will hold 6 slices snugly or use 6 individual dishes and brush with melted butter or margarine. Beat together the eggs, milk and vanilla essence. Place 6 of the slices into the greased dish and the other 6 slices into a similar dish for soaking. Pour about 1/3 of egg mixture over the slices in the baking dish and 1/3 over the remaining 6 slices. Sprinkle lightly with cinnamon sugar and spoon the apple evenly over the bread. Cover with the remaining six slices, pour the remaining egg mixture over the top and brush with butter or margarine. Bake about 30 minutes or until set and golden on top. Serve with syrup and yoghurt, Mascarpone cheese or cream and grilled bacon on the side if used. Recipe and photo by Carolié de Koster. The humble boiled egg is elevated to an irresistible treat with this delicious sauce. The sauce can also be served with cooked chicken or vegetables. To make the sauce, place 300 ml of the milk in a saucepan and bring to the boil. Mix the remaining milk with the cornflour and stir into the milk as soon as it starts boiling. Stir with a whisk until the sauce becomes smooth and thickened. Blend the remaining ingredients and stir a little of the hot sauce into the mixture. Add to the saucepan and bring the boil, stirring continuously. Remove from the heat and keep warm until ready to serve or allow to cool and reheat gently while stirring when required. To boil the eggs, place the eggs in a saucepan and cover completely with cold water. Bring to the boil slowly and as soon as boiling is established, turn down the heat and simmer gently for the desired length of time (see notes below). Remove the eggs from the saucepan and rinse under cold running water. Peel the eggs and set it side. Serve the eggs on toast with the sauce on the side. – Add about 50 ml fried chopped onion or spring onion and 15 ml chutney. Oopsie bread or Oopsies is all the rage these days due to the fact that it is low in carbs. Nothing more than an improved version of the Atkins Revolution Roll, Oopsie bread provides a gluten-free alternative to bread and even to some types of cakes! The texture is similar to choux pastry and the taste is neutral, not eggy at all as one would expect. It can therefor be served with either sweet or savoury dishes. I prefer to bake Oopsies in a muffin pan (or a swiss roll tin for roulade). I have successfully used Philadelphia cream cheese, creamed cottage cheese and cream cheese. By simply adding sweet or savoury ingredients Oopsies can easily be turned into classic sweet or savory recipes. 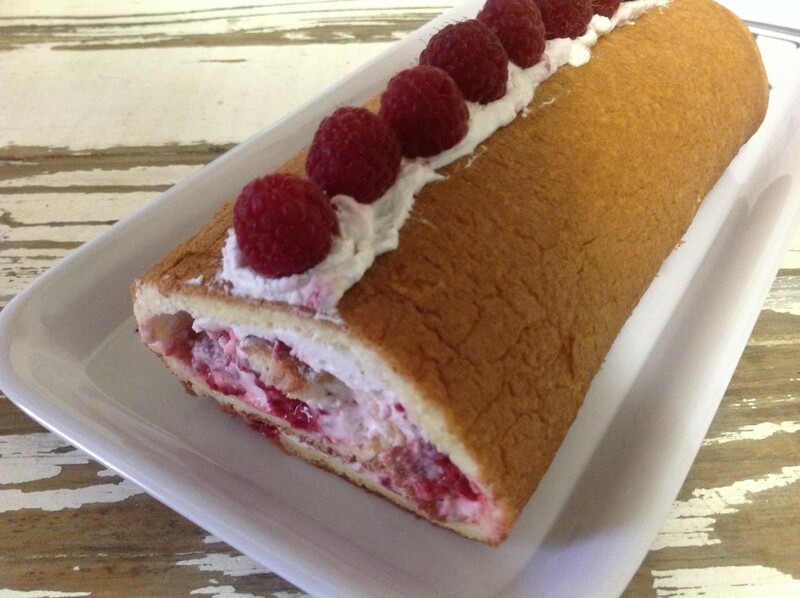 See my recipes for Low Carb Tuna Roulade and Low Carb Raspberry & Cream Roulade. Pre-heat the oven to 170 ° C.
Spray a 12-hole medium muffin tin very well with non-stick cooking spray. The capacity of each hole should be 100 ml. Set it aside. Use a 25 ml measuring cup or a small soup ladle and divide the mixture between the 12 cups. Each cup should only be filled ¾ full. Bake for about 25 minutes or until the muffins are set, puffed and lightly browned. Remove the tins from the oven and set aside for 5 minutes to cool. They will deflate a little as they cool. Carefully remove the muffins and place them on a cooling rack to cool completely or to a serving platter to enjoy warm. Serve with raw honey, grated cheese, basil pesto, olive tapenade, etc. If you want to cut down on carbs, why don’t you opt for cauliflower rice instead of the usual starch options? Just add your favourite stir-fry ingredients! Steam the cauliflower on the stove or in the microwave until soft but not mushy. Transfer the cauliflower to a food processor and process with the pulse function until it looks like rice. Transfer the cauliflower to a mixing bowl and set it aside. Combine the eggs in a small bowl and beat with a fork. Season with salt. Heat a large non-stick frying pan over medium heat and add 15 g butter. Add the eggs and cook in a similar was as if you were making a pancake. When the egg is set, slip it onto a chopping board and set it aside to cool. Add the coconut oil the the same pan and stir-fry the garlic, spring onions, celery and sweet pepper and stir-fry for about 3 to 4 minutes, or until cooked. Add the rest of the vegetables, lemon rind, bacon or chicken, cauliflower and soy sauce, if used, to the pan and stir-fry for about 5 minutes until heated through. Remove the pan from the heat and set it aside. 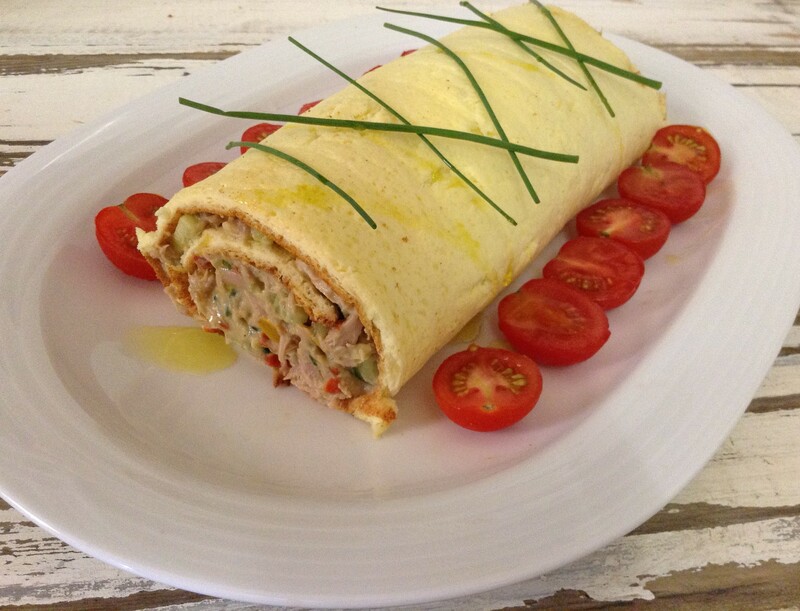 Roll the omelette up like a pancake and slice it into 0.5 cm strips (see photo below). Add the egg strips to the pan and mix well. Transfer the cauliflower rice to a serving dish. Garnish with fresh parsley or coriander and serve immediately. 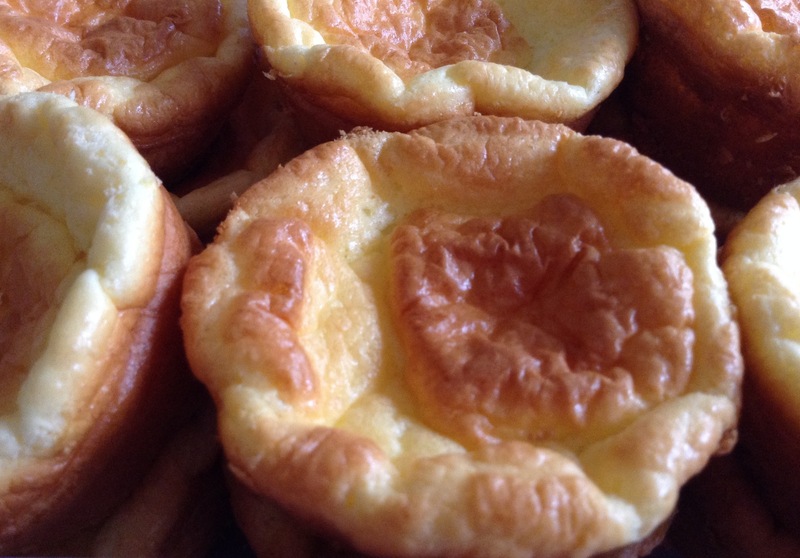 This recipe is made by using the basic recipe for Low Carb Oopsies. It is a great low carb substitute for the traditional roulade base which is usually made from a thick white sauce containing butter, flour, eggs and flavourings. To make the filling, combine all the ingredients in a mixing bowl and mix well to combine. Season to taste and set it aside. Refrigerate for at least 30 minutes before serving the roulade whole garnished with chives, sprigs of parsley, cherry tomato, a drizzle of olive oil, etc.